A SPE Seção Brasil, realizará em 02/04, às 18:00h, no espaço Alumni COPPEAD mais uma edição da TERÇA TÉCNICA, que é um programa de palestras mensais com o objetivo de disseminar conhecimento e permitir a troca de experiências entre colegas de operadoras, academia e fornecedores de bens e serviços. 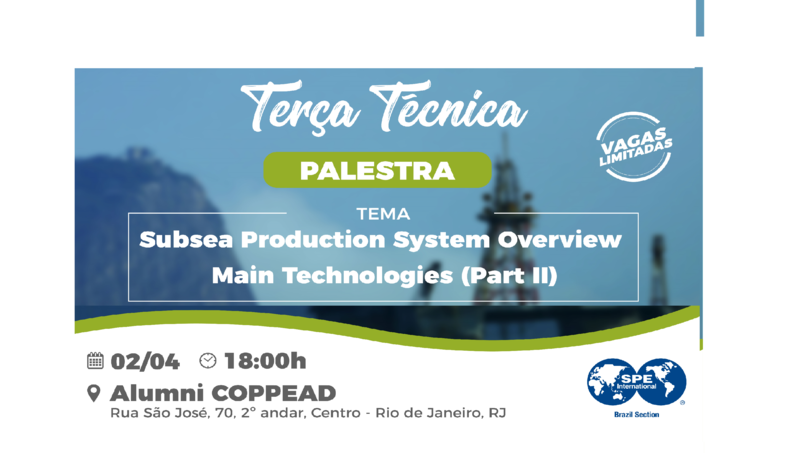 Nesta TERÇA TÉCNICA teremos a continuidade do tema: Subsea Production System Overview – Main Technologies (Part 2)” com o sr. Dalmo Zerbini, da OneSubsea. Subsea Production Systems are typical wells located on the seabed, shallow or deep water. Generally termed as Floating production system, where the petroleum is extracted at the seabed and the same can be tied back to an already existing production platform or an onshore facility. The oil platform well is drilled by a movable rig and the extracted oil or natural gas is transported by submarine pipeline under the sea and then to rise to a processing facility. The development of Subsea Systems demands a multi-disciplinary list of facilities to export the oil/gas from the reservoir up to the production facilities. Number of technologies applicable to equipment, systems and construction resources become continuously higher in the oil & gas industry, requiring specialized management of risks and maturity level. Aiming to achieve the best results, it is crucial that the technological maturity and the risks associated with technologies be properly managed, aiming to guarantee the success of the technology and project. These 2 introduction days aim to present a summarized perspective of a complete offshore field layout with the main technologies involved in the process focusing on wellheads, x-trees, plets, plems, manifolds, umbilicals and flowlines . To conclude the presentation, some videos and major subsea projects will be presented for better understanding about the subsea environment.